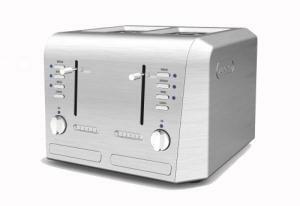 This model, the Esclusivo Pro-Metal 4-slice Toaster, certainly satisfies the desire of those that like a heavy, all stainless steel machine. The case is extra thick and comes with solid die-cast metal levers and buttons. No plastic here. It carries the usual handy features such as adjustable darkness settings, and a Cancel and Reheat button. Settings are clearly displayed thanks to bright blue LEDs contributing to the sleek modern appearance of this toaster. It also accommodates the needs of bagel lovers with a bagel setting that only toasts the inside half. (Follow the instructions for the correct direction to insert the bagels, or you'll toast only the outside half.) Extra large and wide slots should accommodate the chunkiest slices of bread. This advertises an advanced electronic sensor that monitors the internal temperature for consistent results. Some users have had great success with this toaster while others have had difficulty getting the toaster to produce the results they desired. As with anything, your mileage may vary. Delonghi provides a one-year warranty with this toaster, and I would look for a free-shipping option if you order it online, as the shipping weight of this beast is 10 lbs. That is one heavy toaster! For another 4-slice retro toaster design, see the KitchenAid Metal Toaster.